I’m a sucker for Ethnographic Museums and I’m a sucker for traditional costumes so I was really looking forward to this one. Unfortunately, there was a NO PHOTO rule which was hysterically implemented, so this is quite a picture-empty post, which is a shame, not least because it would be nice to show off the collection. But first: the building. And it is a grand one. It was the old granary for the city, built in 1590, with fifteen storage pits in the ground floor, carved out of the tufa bedrock, and with space for drying on the upper floors. As one of the very sweet, chatty and informative ladies who worked there told us, the building was seen as a lifeline for the city, because it it kept a large stockpile of grain that the citizens knew they could depend on. 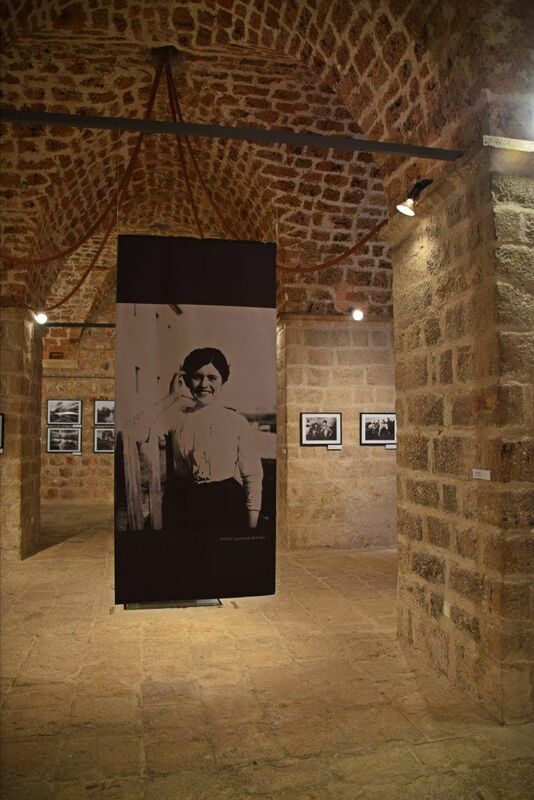 Upon entering the museum, you walk into a vast, arched room, which when we went had a nice display of reproduction photographs from the early 20th century by an amateur photographer, Mate Kaić. There were some very striking images: the smile of a pretty girl, the first car in the village, farmers toiling in the fields. However, it’s clear they regularly change the exhibitions in this room, so I hope you also get to see something fun and informative. 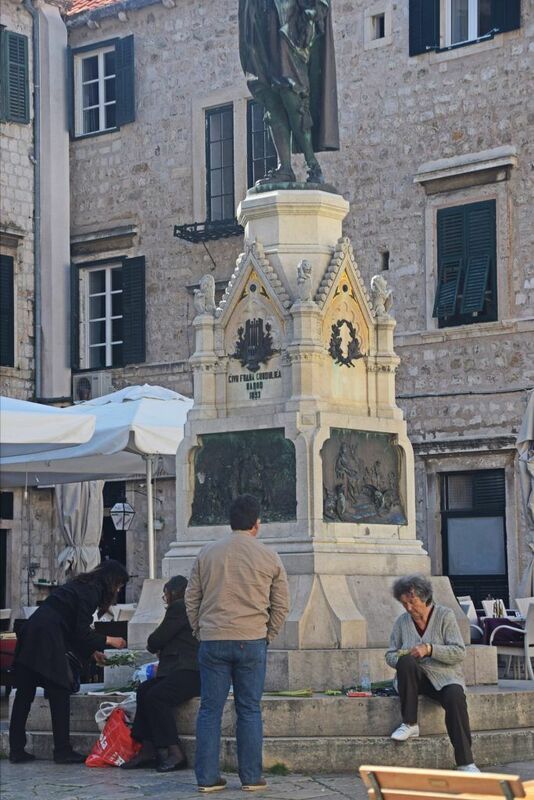 The first floor has recreated some scenes showing the daily living of people from Dubrovnik and its environs. There is an appetising meal laid out on one side, and living quarters on the other. Farm equipment and various practical tools that were used in country life basically decorate the room. It was pleasant, but not exciting. The top floor was the most interesting for me, because it has a lovely range of local costumes. Also the lady who was working there happily talked us through some of the outfits, and made us appreciate some cultural traditions by linking what we saw to the modern day. In the museum there was a display of coloured eggs and some intricately woven palm leaves. The lady explained the traditional method of decorating eggs – that the pretty patterns are painted in wax, before the egg is dyed in whatever natural organic items they have around, to create anything from a pinkish, to a rich, dark reddish brown shell. The wax is then chipped off, leaving behind the pattern. It is a traditional skill that a townie, like our lady, doesn’t have – it’s something women in the countryside do. They then come into town and sell their wares so that families can buy them, and place them on the dining table along with the rest of the Easter feast. 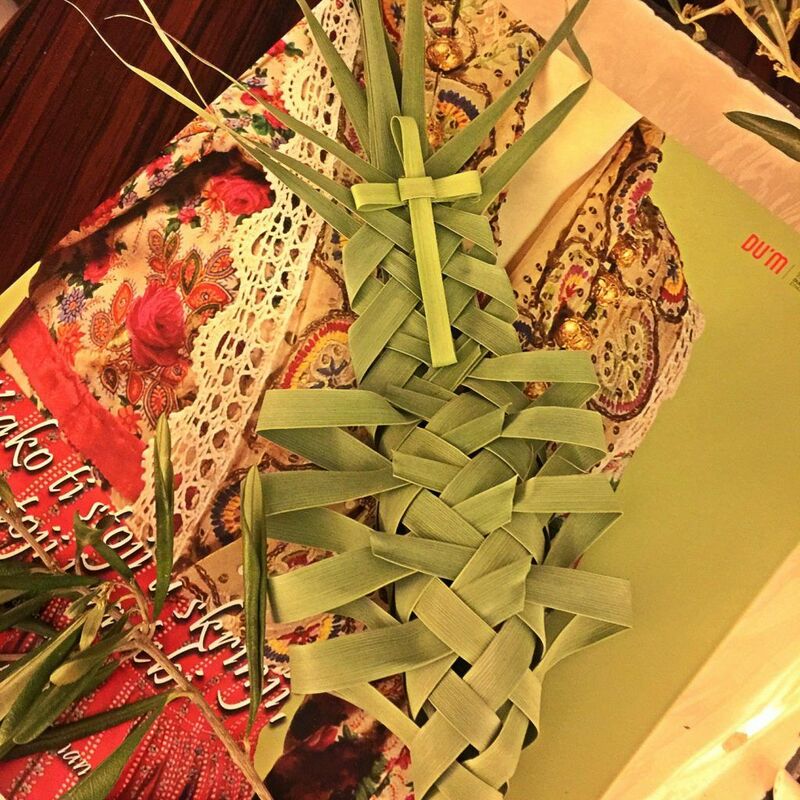 Another important presence on the Easter table is the woven palm leaf. 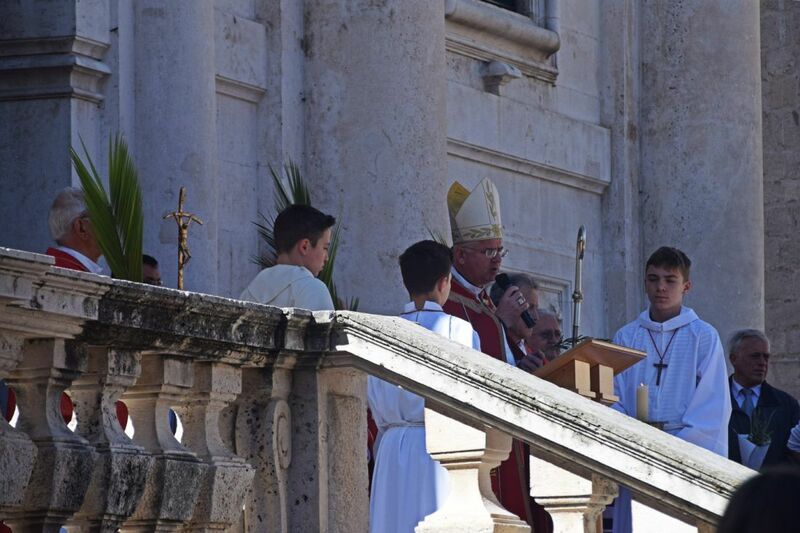 This is done for Palm Sunday – coincidentally, a day that we were in Dubrovnik. Just to go away from the museum for a moment, and to show you the continuation of traditions, I would like to share our experience of Palm Sunday. When we went into the old town, we saw ladies selling woven palms. I got one from a lady outside the Pile Gate. Sister Chickpea was handed an olive branch by a nun, and so together we had two traditional items that many of the citizens of Dubrovnik had that morning. The idea is that the palm gets blessed during the Palm Sunday service and it is kept till the following year, when it is burned and its ashes are used on Ash Wednesday. 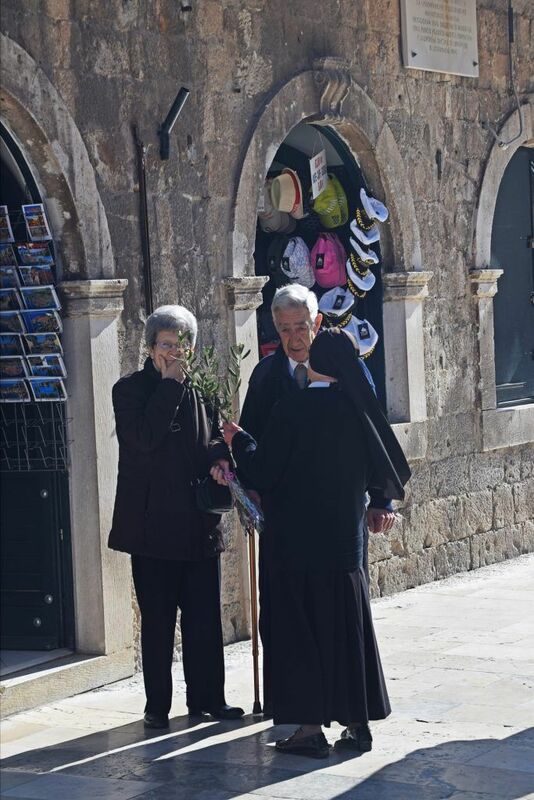 It was lovely to see people of all ages walking around with palms and olive branches – and whole families coming out together. There was a real sense of community, with people bumping into acquaintances in the street and having a chat. On the steps of St Blaise, Dubrovnik, Croatia. A short, open-air service was held, before everyone marched back to the Cathedral. 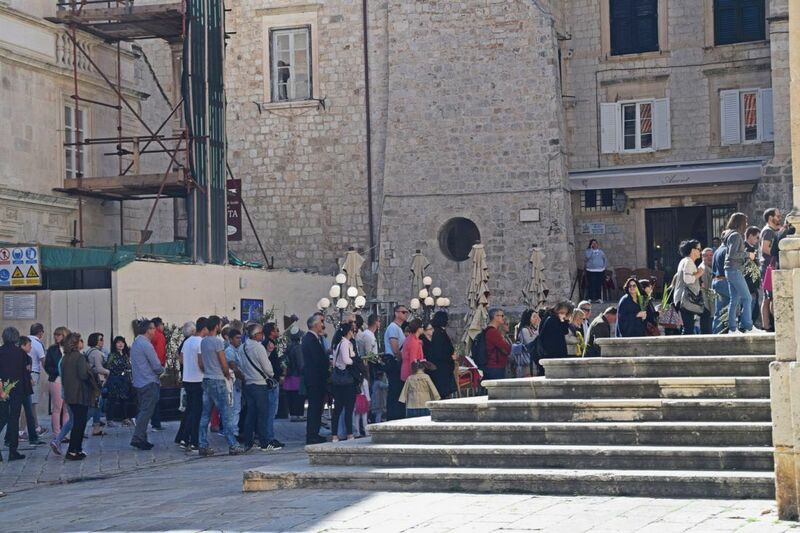 People lining up to enter the Cathedral on Palm Sunday, Dubrovnik, Croatia. You can just about see that the people on the steps have palms and olive branches. But back to the museum. As I was saying, there are lots of local costumes, and it was interesting to see just how much variety there was in a such a small area. While the ladies in Dubrovnik proper pranced around in European fashions, the country girls got to wear fantastic outfits, some of which looked Ottoman. The girls also wore unexpectedly lively wedding costumes – really full of bright coloured chintzy fabrics and a band of flowers across the head. All in all, the museum may not have any amazingly exciting exhibits, but it’s very interesting for anyone keen to find out about the culture of the area around Dubrovnik. Plus the costumes are pretty. Did I mention that there was a no photo rule?